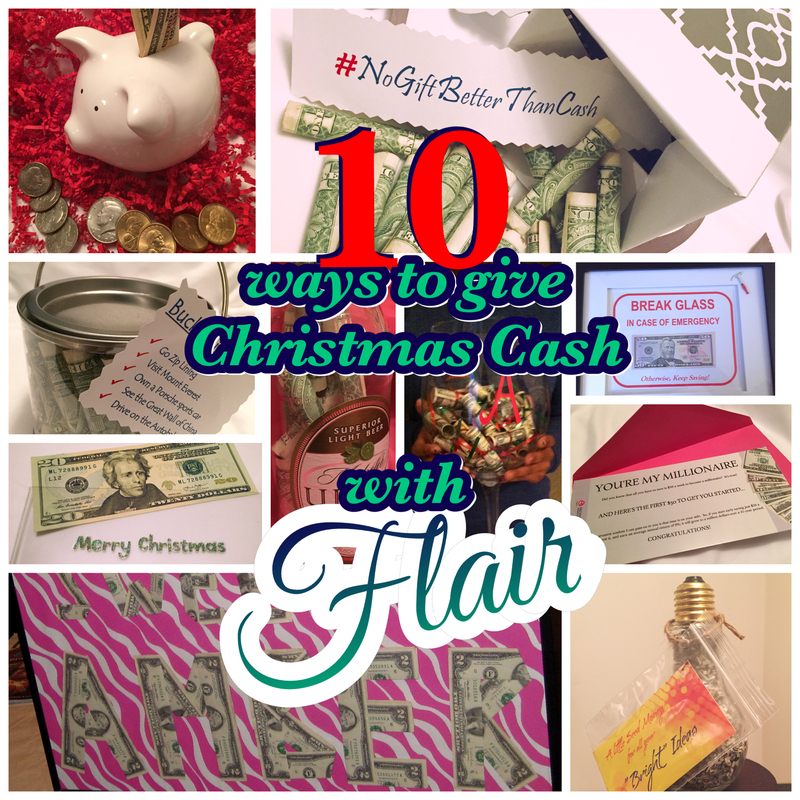 10 Ways to Give Christmas Cash…with Flair! I love giving cash for Christmas! Not in an “I forgot about you so I’m digging for a crinkled up $20 bill at the bottom of my purse” kind of way, but a really thoughtful gift. Guessing what people really want is just too hard! Most of us spend more on gifts when using a credit card and seeing the bill the next month is depressing. I thought giving gift cards was the answer, but I recently read a study which showed an astounding $1 billion in gift cards go unclaimed, unused, or expire (www.ceburl.com/giftcards). Gift cards also encourage people to spend more than the value of the card because most stores won’t give you cash back if you don’t spend the entire amount of the card. 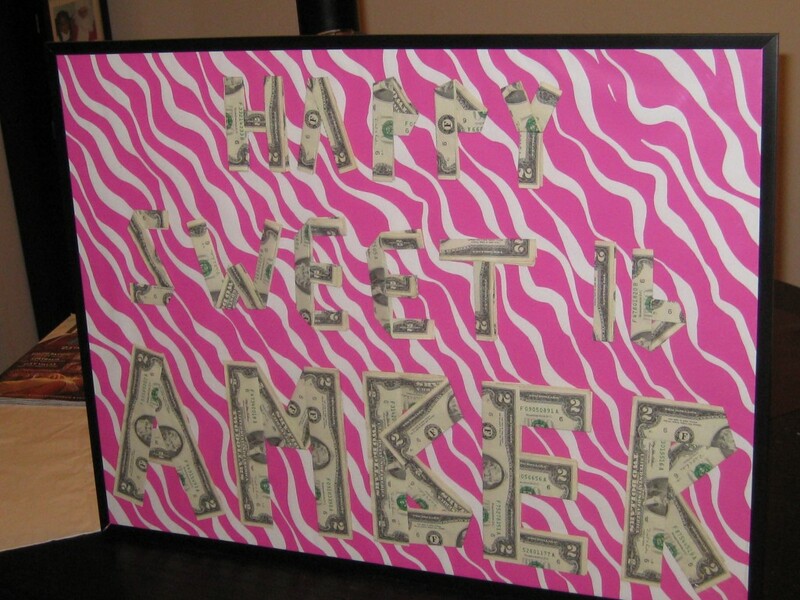 My greatest motivator of all was that after my daughter turned sixteen, the only gifts she received with excitement and glee was cash…dollars…Benjamins! 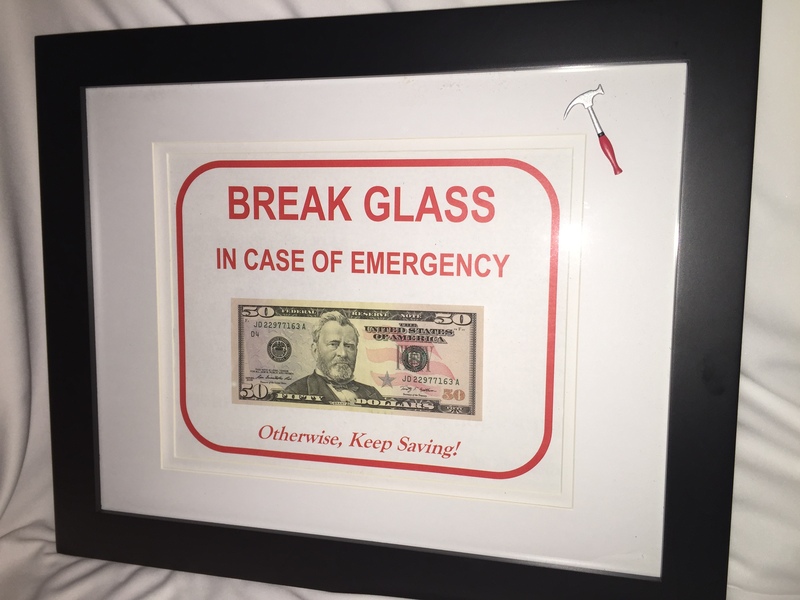 I’ve always taught her that it was the thought that counts, so I definitely needed to come up with some fun ways of giving her cash using my own brand of ingenuity (often in a sneaky way to get her to save instead of spend). Now, on all her special occasions, she not only looks forward to receiving money but also looks forward to the unique flair they are presented with. I’ve always believed in doing smart things with my money and now I’m literally doing smart things with my money. After changing my gift-giving tradition with my daughter, I decided to extend that to others. It took a while, but once I started, the ideas just kept rolling. Now, with the holiday season upon us, I wanted to share some of my favorite creations to help inspire those of you that are as frustrated with buying Christmas gifts as I am. Let’s spread a little holiday cheer…and a little holiday cash! Get a faux clear glass bulb with twist off top (available at most craft stores). Inside it, place legally shredded money bills from the US treasury (order online) or rolled up $1 bills. 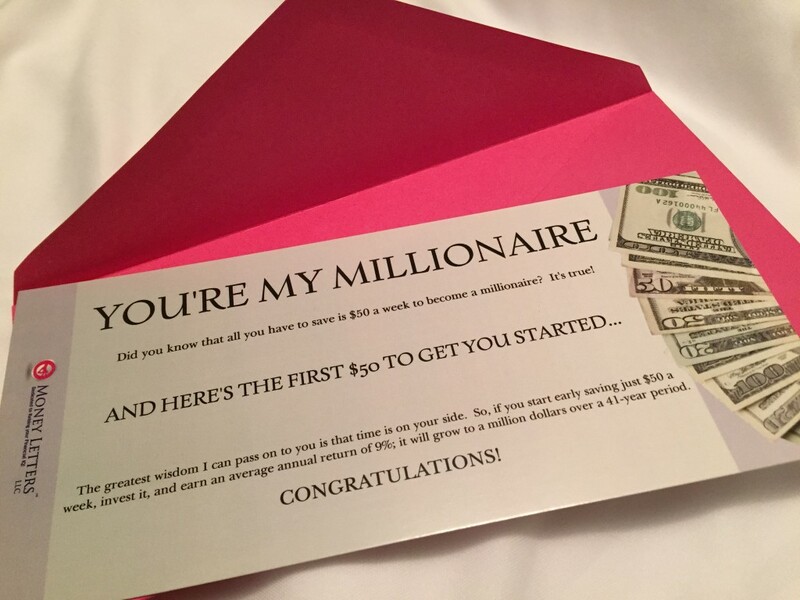 Attach a single bill of your preferred denomination folded in half and an inspirational money message. 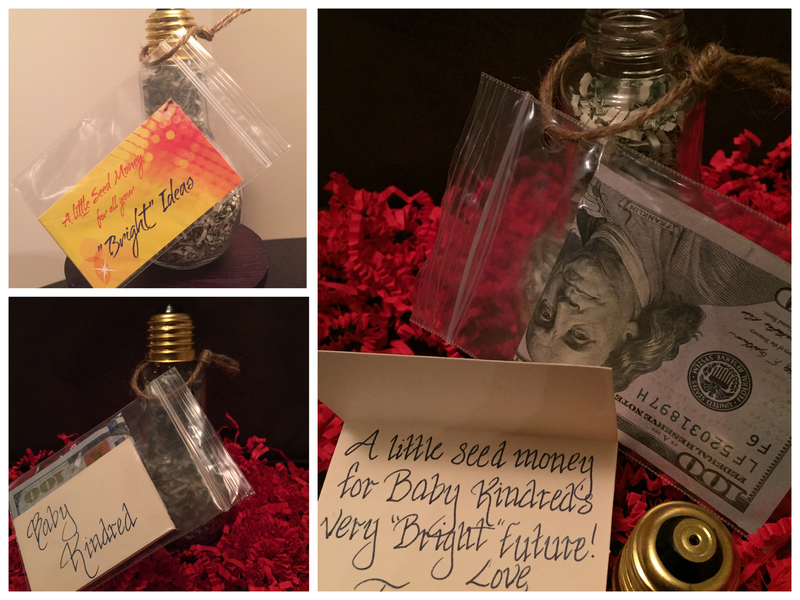 My favorites are: “A little seed money for all your bright ideas”, “A little seed money for baby’s very bright future” and “Teachers inspire bright futures”. 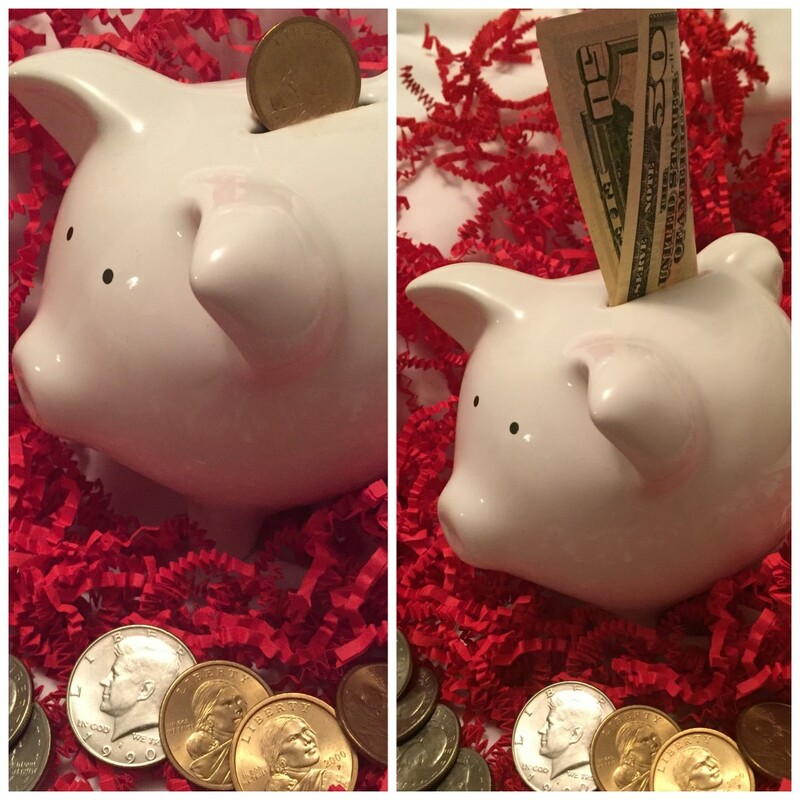 Give a piggy bank with a little money to start their savings and a little money for them to spend now. In the top opening of the bank, you can display a single bill or unique coin like a golden color Native American $1 or Presidential $1. Display money inside a clear glass frame or container with a message that says “Break glass in case of Emergency”. To make it even funnier, include a small replica of a hammer. 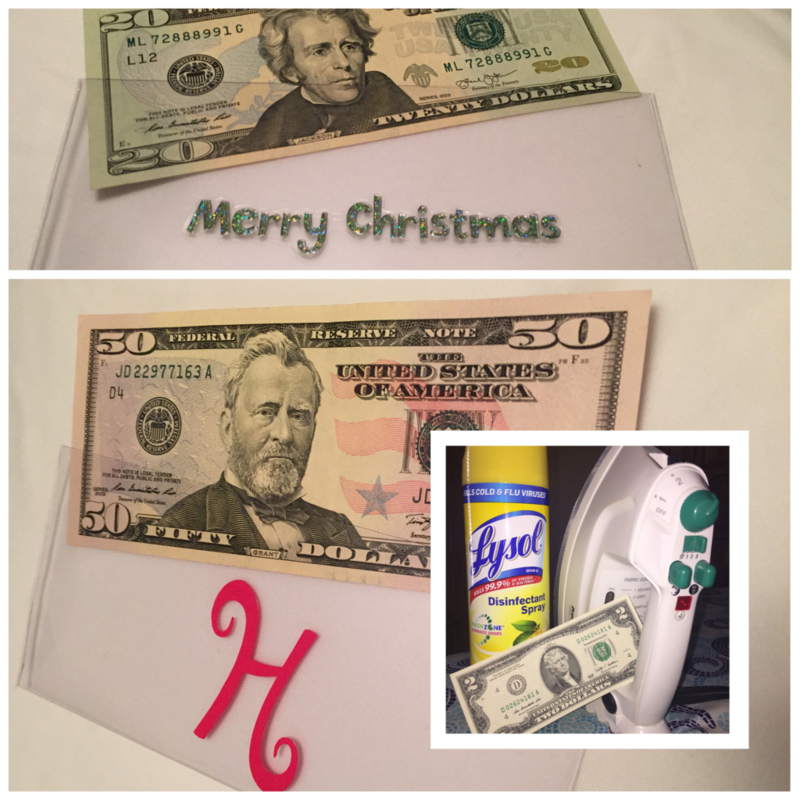 Fold bills using origami art that spells out the receiver’s name or holiday greeting. Place in a frame using cool designer background paper with their favorite color or print theme (try wrapping paper or scrapbooking sheet). 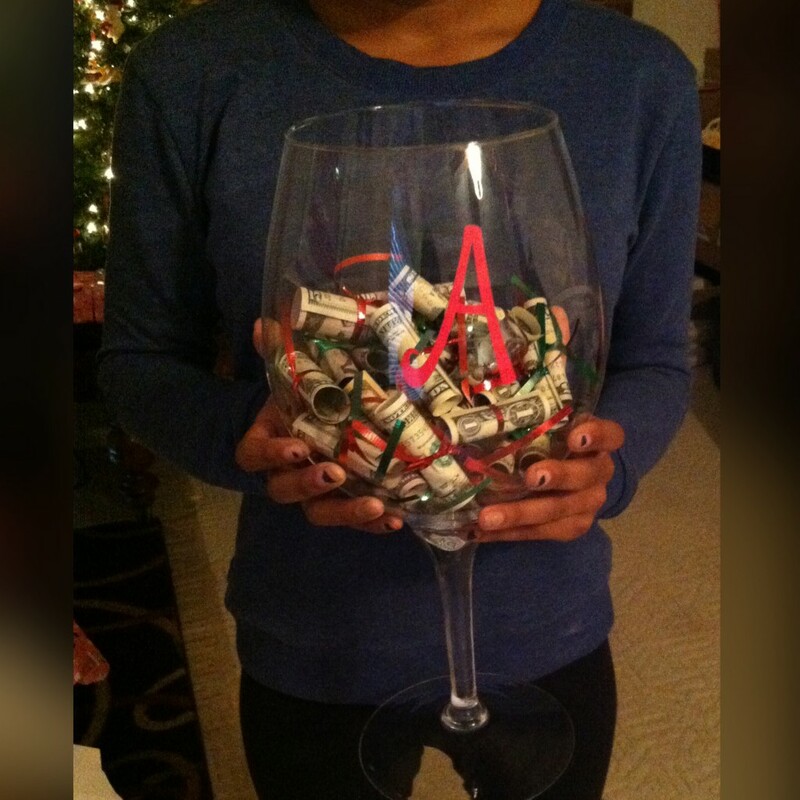 Get an oversized wine or martini glass and fill it with individually rolled bills, each tied with ribbon. To really jazz it up, use decals, stickers, or stencils from a craft store to affix a monogram, the recipient’s name, or an inspirational word on to it (like Hope, Joy or Splurge). Get a new, single bill like a $20 or $50 from local bank or credit union (my favorite is a $2 bill for small gifts). To make the bill even more special, spray it with Lysol or starch, and then iron it. This will make the bill stiffer and smell really clean and fresh (brings new meaning to “money laundering”). To present it, place it in a clear bill sleeve (found at most hobby stores) and affix an expressive decal or monogram that you can get in the scrapbooking section at a craft store. Include an inspirational money message or advice with the cash. 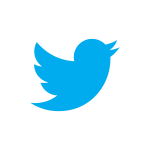 The one I use is: “Did you know it only takes $50 a week to get to a Million Dollars? It’s true… you save $50 a week for 40 years with a 9% return, you’ll have a Million Dollars and here’s the first $50 to get you started.” You can have these printed up just like you would holiday cards. 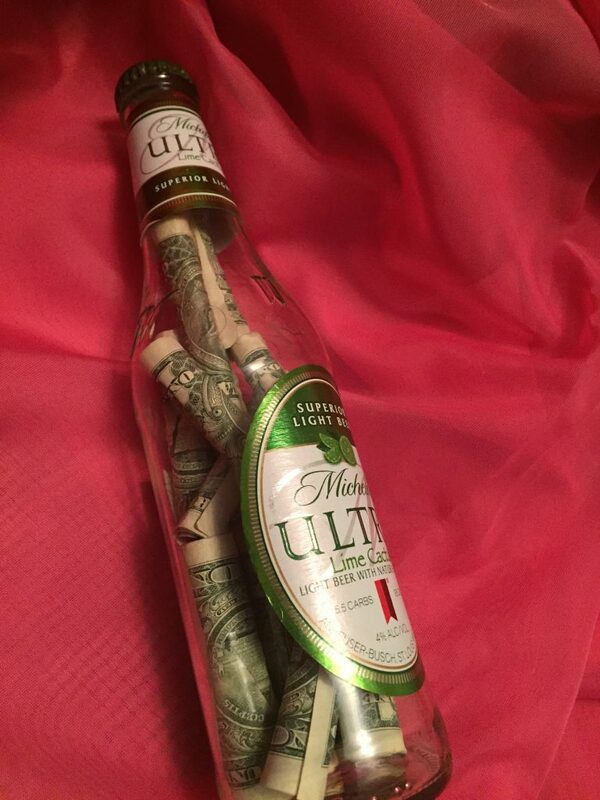 Take a clean, empty beer or wine clear bottle of one of the recipient’s favorite drinks and fill it with bills. Just use a wine gift bag for the packaging for a great presentation. 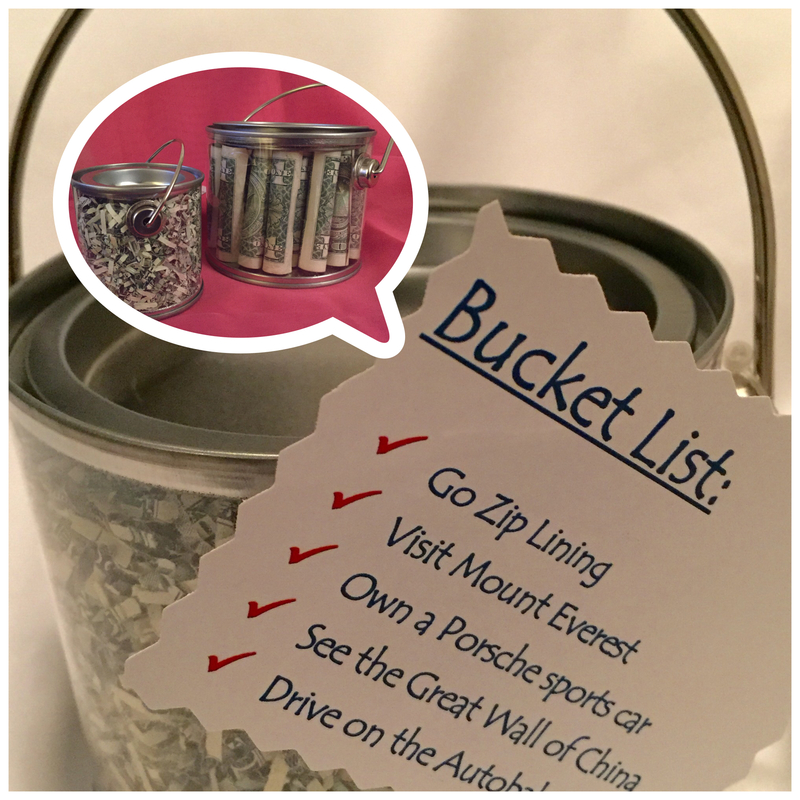 Fill a small clear plastic paint bucket (found at a craft store) with rolled bills or shredded money and attach a short list of things you know are on their “Bucket List”. Use a beautifully wrapped box and fill it with small denomination bills and something to add weight to the box so the receiver will never guess what it is. 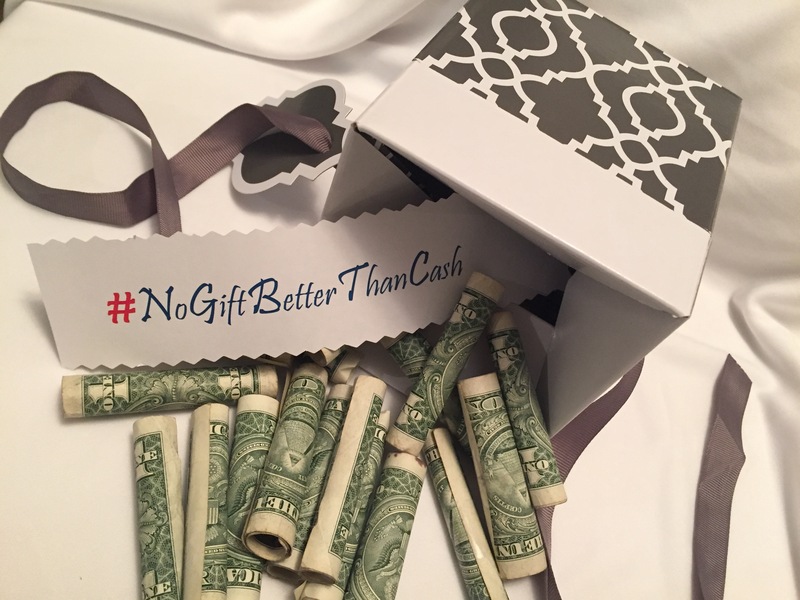 Add a note something like this: “There’s no gift better than cash” or hashtag it #NoGiftBetterThanCash.